North Korea on Jan. 29 called off a joint cultural event with South Korea that was to celebrate the upcoming Winter Olympic Games. Pyongyang cited what it claimed to be “biased” media reports about the scheduled Feb. 4 event at Mount Kumgang in North Korea, the South Korean Yonhap news agency reported. The North also reportedly took issue with South Korean reports that the North was considering holding a parade marking the 70th anniversary of its military on Feb. 8, one day before the start of the 2018 Winter Olympics in PyeongChang. The Feb. 4 event at Mount Kumgang was to be part of a series of events to be held in the divided Koreas ahead of the Olympics. Pyongyang also agreed to stage art performances and taekwondo demonstrations in South Korea to commemorate its participation in the games, the Yonhap report said. North Korea reportedly also will host a group of South Korean skiers for a joint training session at its Masikryong Ski Resort on Jan. 31. 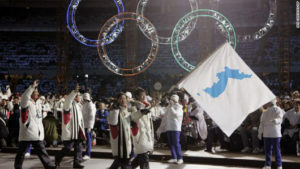 “Whether the other events will be held as scheduled could not immediately be confirmed,” Yonahp’s report said, adding the scheduled events include art performances by a North Korean art troupe in Gangneung, near the host city of the Winter Olympic Games, and Seoul.